Can You Lose Weight by Only Drinking Water? Water is an essential fluid that makes up over half of the human body. When attempting to quench your thirst, choosing water over sugary drinks like soda can help prevent weight gain by reducing caloric intake. Understanding the connection between losing weight and drinking only water allows you to safely use this technique to achieve maximum results. Water is a calorie-free drink that provides hydration and quenches thirst. Unlike sugar-sweetened beverages, water does not contribute calories to the diet, making it a better choice for daily consumption. According to the National Institutes of Health, high soda intake is clearly linked with weight gain. By choosing water over sweet beverages like soda, you reduce the amount of calories ingested daily, which is one way to lose weight. A study by Brenda Davy in the July 2008 volume of the "Journal of the American Dietetic Association" states that older adults who drank 500 ml of water just 30 minutes before meals consumed about 13 percent fewer calories than controls. Water contains no valuable nutrients, making it an unsuitable substitute for food. Using water as a food replacement can lead to serious health problems. MayoClinic.com lists anemia, bone loss and heart problems as consequences of food deprivation. 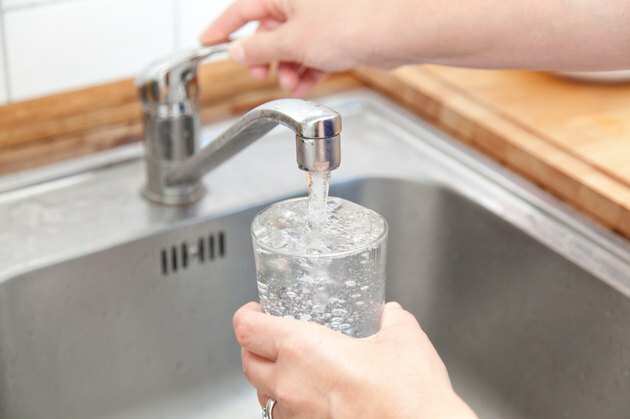 In addition, drinking too much water can cause an imbalance of electrolytes in the body, which may result in death by water intoxication, according to the National Institutes of Health. Symptoms of water intoxication include headache, confusion, nausea and changes in behavior. While water needs vary, Medline Plus suggests drinking between six and eight gasses per day. Water consumed through the diet in the form of soups, herbal teas, fruit and vegetables counts toward your daily recommendations. Because of their dehydrating effects, alcohol and caffeinated beverages should not be considered water substitutes. Drinking a glass of water 30 minutes before meals may help you feel full and reduce the amount of food consumed. When attempting to lose weight, avoid using water to replace food. Eat a variety of healthy foods like fruits, vegetables and whole grains while replacing sweet drinks like juice and soda with water. Eating foods with a high water content, such as soup, cabbage and celery can help you meet your daily water needs without missing out on vital nutrients. How Much Water Should I Drink With 50 Grams of Fiber?